Delfina Soares is the Head of the United Nations University Operating Unit on Policy Driven Electronic Governance (UNU-EGOV). Delfina has been associated with the Operating Unit since 2015, when she joined as Adjunct Associate Professor. 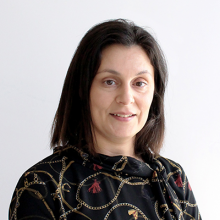 She has strong ties to UNU-EGOV’s host university, the University of Minho, where she has held various positions over the past 18 years, including Lecturer and Assistant Professor at the Department of Information Systems and as a Researcher with Centro ALGORITMI. She holds a PhD in Information Systems and Technologies and a MSc in Informatics, both from the University of Minho. Her areas of research and expertise include electronic governance at a national, local and sectorial level, electronic government interoperability and cross-agency collaboration, electronic democracy and electronic participation, and electronic governance measurement and monitoring. She has been member of organizational, programme and scientific committees of multiple conferences, tracks and workshops in the Information Systems and Technology (IST) area and, particularly, in the e-Governance area. Delfina has also participated and supervised national and international research projects in the area of IST in governance, and delivered talks, seminars, and presentations on the theme of e-Governance to postgraduate students and to public administration practitioners. Delfina is member of the Executive Committee of the Observatory for the Study and Development of the Information Society (GÁVEA), and board member of the Portuguese Chapter of the Association for Information Systems (AIS) and of the Executive Committee of the Portuguese Association for Information Systems (APSI). She is also member of the WG 8.5 (Working Group on Information Systems in Public Administration) of the TC 8 (Technical Committee on Information Systems) of the International Federation for Information Processing (IFIP).